B4 mistitled 'Walking In The Sand' on the cover artwork and download files. D1 and D5 are exclusive to this compilation. Durations are printed on the back cover. 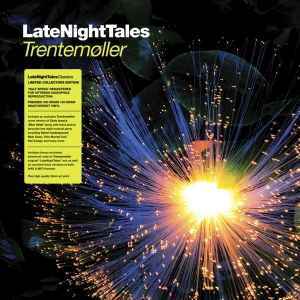 Includes 12" art print, and download code for the mixed and unmixed versions of all tracks that appear on the Trentemøller - LateNightTales CD version, in WAV and MP3 format. (p)&(c) 2011 Night Time Stories Ltd. The buyer is responsible for the shipping fee! We usually ship once a week on wednesdays! Unfortunately our postal service just increased shipping costs yet again. pls see below a list of shipping options. upto 500grams - within the EU - 10,75 EUR - ALL PACKAGES ARE SENT REGISTERED! between 500 and 2000 grams - within the EU - 21,5 EUR - ALL PACKAGES ARE SENT REGISTERED! upto 500grams - outside the EU - 11,75 EUR - ALL PACKAGES ARE SENT REGISTERED! between 500 and 2000 grams - outside the EUR - 24,3 EUR - ALL PACKAGES ARE SENT REGISTERED! We take no responsibility for any damage caused by the postal service, however we do our best with packaging! Soundclips are available on our website!